In the space, we added in three different sections of draping. 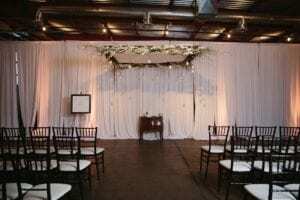 The first wall of draping was added in for the ceremony, which Breath of Springs added in an rustic, greenery ceiling treatment. We also had draping for a private entrance for the bridal party. The final section was a beautiful focal point behind the head table. We love the mix of the brick walls and soft ivory chiffon! 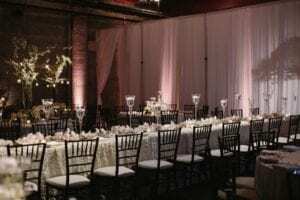 With just these three sections of drape, the venue transformation was amazing. 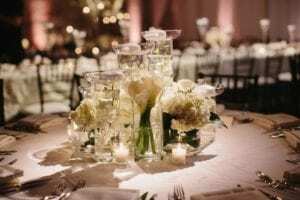 We continued the soft ivory touches onto the head and guest tables. 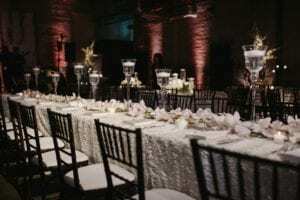 For the captains table, we used the Ivory Emma, paired with the Ivory Satin Napkins and Mahogany Resin Chiavari chairs. The texture pairs perfectly with the Ivory Velvet linen used for the guest tables. The mix of the textures truly adds an interested to the eye when looking at the room as a whole! 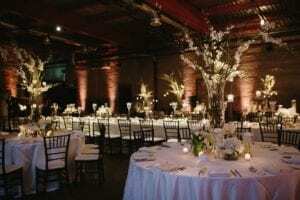 To top off the look, Breath of Spring added in neutral flowers and clear vases, to keep the look light and soft. Big thank you to the amazing vendors we had another chance to work with; The Eastern, The Bash Events, For The Love of It & Breath of Spring!